RA and Corticosteroids: What is the Role of Steroids in Arthritis Treatment? Rheumatoid arthritis (RA) treatment consists of a variety of medications. 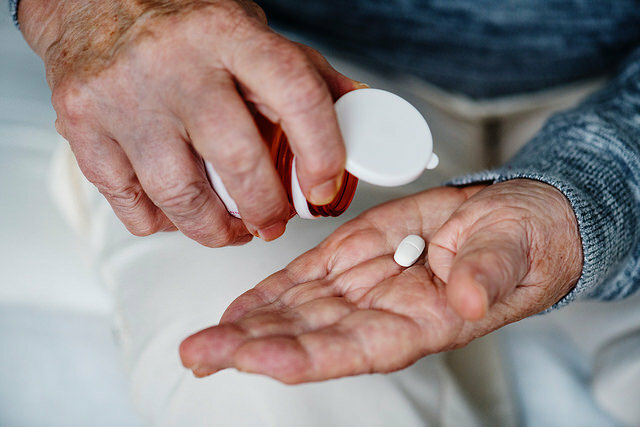 Most patients use a combination of medications including disease-modifying anti-rheumatic drugs (DMARDs), biologics, analgesics, nonsteroidal anti-inflammatory drugs (NSAIDs), and corticosteroids. Corticosteroids are a highly-effective but potent drug for treating RA inflammation and pain. They are used in short-term situations and may not be appropriate for all patient cases. Corticosteroids are steroidal medications given to RA patients to reduce inflammation and help regulate autoimmune activity. Corticosteroids have been used for over five decades to help treat RA symptoms. Often times you will hear corticosteroids referred to as glucocorticoids. Many RA treatment strategies still use corticosteroids in combination with NSAIDs and DMARDs because they not only reduce inflammation but they can also help protect joints and organs from future damage. The human body naturally produces cortisol (and other hormones) from the adrenal glands which reside above the kidneys. Corticosteroids mimic these hormones’ effects on the body, and when prescribed in a high enough dosage, they suppress the immune system, resulting in decreased overall inflammation levels in the patient. Corticosteroids prescribed to RA patients reduce the levels of inflammation that cause joint pain, stiffness, and bone and cartilage deterioration. Corticosteroids also act as immune system inhibitors (or immune modulators) by suppressing antibody formation and subsequent attacks which cause inflammation in RA patients. Besides RA, corticosteroids are used to treat a number of other inflammatory and autoimmune disease such as lupus, asthma, skin conditions, and a variety of allergies. Prednisone is the most commonly used corticosteroid in treating RA. How are Corticosteroids for RA Administered? The pill formats of corticosteroids are usually taken orally once daily in smaller doses. Most types of corticosteroids are taken when the patient wakes up in the morning. This is because the steroids mimic the body’s own natural hormone production. Patients also take corticosteroids upon wakening to alleviate symptoms of morning stiffness. Intra-articular steroid injections are proven to be highly effective as they deliver the drug directly into the inflamed area. Corticosteroid injections are typically delivered several months apart. Doctors may recommend that patients only receive a maximum of three or four corticosteroid injections per year. Usually, corticosteroids are prescribed in a low dosage for a short period of time. Because corticosteroids are so potent, it is best to slowly and gradually reduce the dosage over several weeks to prevent symptoms of withdrawal. This is as opposed to stopping taking corticosteroids abruptly, which can sometimes cause negative reactions in patients (like dizziness and low blood pressure). Corticosteroids are typically taken in conjunction with disease-modulating anti-rheumatic drugs (DMARDs). For most patients, DMARDs can take weeks to begin working. In this time, it’s important to try and get the disease under control as much as possible. Using corticosteroids during this waiting period is a highly effective method of reducing inflammation and helping alleviate pain and stiffness for the patient. Corticosteroids may also be prescribed during periods of flare-ups, whereby the disease becomes highly active and severe symptoms appear. Corticosteroids are used to quiet down the symptoms and provide immediate relief for patients. In general, corticosteroids are viewed as a “bridge therapy” option for treating RA patients. This means that they are used in select cases for a short period of time at smaller doses. This is primarily due to the number of severe side effects associated with corticosteroid use. Though corticosteroids can be very effective at reducing inflammation and alleviating pain, they do carry many serious side effects. Side effects from corticosteroids are more likely to occur when they are used as regular treatment over a longer period of time. This is why physicians try to limit the long-term reliance on corticosteroids for RA treatment. Usually, intra-articular corticosteroid injections don’t produce as severe of side effects as oral corticosteroids produce. However, corticosteroid injections may produce separate side effects than oral corticosteroids. For example, many patients develop skin irritation and rashes at the injection site. Today, many physicians choose to avoid using corticosteroids as a standard RA medical treatment. Many doctors will try to minimize its use and eventually eliminate it completely from the medical treatment strategy. RA patients taking corticosteroids will experience nearly immediate relief of symptoms. Corticosteroids target inflammation quickly, relieving the patient of pain and stiffness, which helps restore quality of life. As a temporary and short-term medical treatment, corticosteroids usually provide a very positive outcome for RA patients and can help suppress the disease’s progression and preserve joint function. In some situations, corticosteroids are prescribed to reduce inflammation in RA that has begun to impact vital organs. In these situations, corticosteroids can be critical and even life-saving. Corticosteroids for RA are just one potential element of an overall treatment strategy that is comprehensive and personalized to each patient.